When marching band season is over, it’s always hard to know what to do with yourself. Back when you were at practice, you’d always think about how it would be nice to have free time in the afternoons and not have to fit all your homework in the time before and after rehearsal. At a certain point, you feel ready to have empty Saturdays without commitments and to have a break from playing your instrument (which you may or may not have begun to resent). The bowl game is always a nice final hurrah for the season, and after it’s over, you feel prepared for a semester without marching band before you gear up again for band camp. But it doesn’t take long before you start to miss it again. You start to miss the slow trickle of your friends onto the field at 5:30, and the one guy that always strolls in at 5:39 without his music. You miss the soothing tones of Arami Ivi and the echo of the drumline against the baseball stadium. You miss loading the UDB app on your phone and asking the people around you a billion times what set we’re on. And you miss that first full run with both marching and playing that always looks like a bunch of monkeys were handed instruments and told to walk around without running into each other. But as spring semester goes on, there are plenty of other things that you begin to miss about marching band. For one, band camp. When you show up to register in August and the pep tunes are playing overhead while you stand in the ridiculously long line. Picking up your instrument for the first time the day before auditions, freaking out a little bit, and then practicing until you think you probably won’t be cut. Feeling relieved when you make the band and then gearing up for an 8 AM rehearsal the next morning. Doing all of the band camp traditions with your section, like Bojangles for lunch or hiding and napping during sectionals. Getting the sheet music for the first show and then repping your favorite exercise of all time—marching fundamentals. Practicing pep tunes under the pavilion and hearing your name over the speakers during Meet the Band. Getting to the know the rookies and roasting with them under the sun through layers of sweat and sunscreen. Soon, you’re missing Hokie football too. When you hear the cannon go off during game day rehearsal and everyone takes a second to cheer. 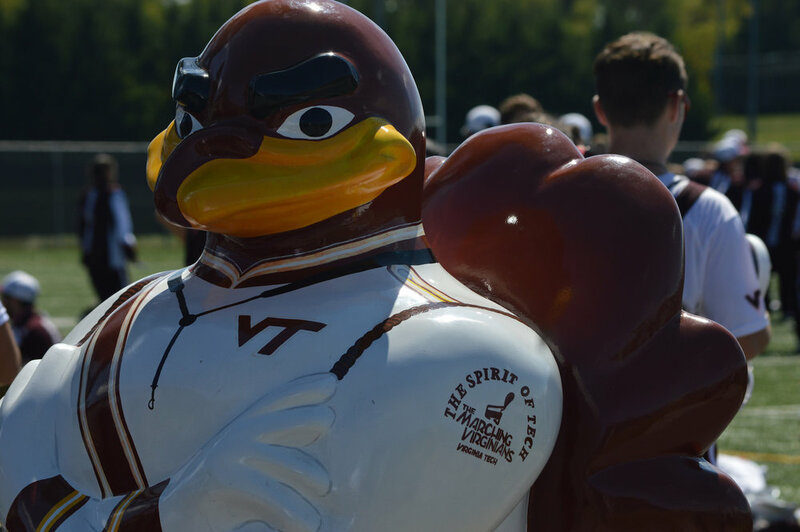 When you nearly blow out your thigh muscles doing motorcycles with Dr. Polly before the march to the stadium, and cheering ‘Go Hokies’ and high fiving people on your way in. Watching the entire stadium pulse the moment that Enter Sandman comes on, screaming your guts out, and then listening as the music cuts and you can hear 66,233 people singing the chorus. You miss shouting along to drum cheers and asserting that although the quarterback may have enjoyed being sacked, it’s acceptable in today’s society. You might miss finding the black turf turds everywhere, but probably not, since you are definitely still finding them. You miss being one of three hundred and thirty performers in an amazing organization that brings the “Spirit of Tech” to every single performance. But most importantly, you miss the incredible people you do all of that with. At this point in the school year, everyone’s ready for a break from rehearsals and performances. But over the course of the semester, we’re reminded of why we chose to do band in the first place. When August rolls around again, as it always does, we’re ready to go.